Hello! Are you there? I think you need to get your dance steps polished for this new Club/Street banger Shaku Shaku Bang by Djfanes_D Man With 2Jobs. 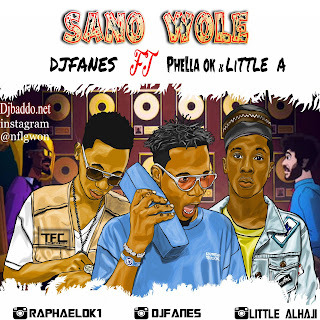 Djfanes recently dropped a single Atewa that has been making waves on radio stations across Nigeria and beyond. The video for his hit self-titled single Djfanes is also one of the best music videos on tv stations currently. Based in , Abuja, Djfanes is known has the “D West African Hardest Dj” and. He is an exceptional musician with a very talented voice. He has featured and worked with super stars like Davido, 9ice Soul E ,Style Plus,Terry tha Rapman. He is signed with #TFC Entertainments. Djfanes is popularly known as D West African Hardest dj is here again This time with his second hit single of the year titled Shaku Shaku Bang. You can shaku shaku it you can even do freestyles. You must just Dance! Even if you cannot dance, Wanche will make you dance.